For those that follow me on Instagram @minilicious, you already know that a couple of weeks ago I co-hosted my good friend Minya aka Miss Info’s baby shower with Lisa Chu, Christine Su and Jen Bui at Kinfolk 94. 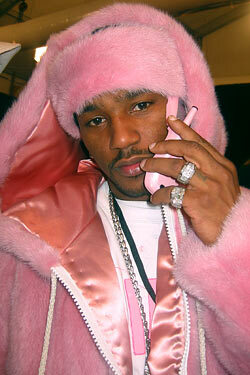 Since Miss Info is having a boy and works closely related to hip-hop, the theme was inspired by rapper Cam’ron’s infamous pink mink outfit he wore back in 2005. The invite had “Baby Info” dressed up in a baby blue mink with a pacifier! So cute right? Loves it! There was also a candy station, baby Converse and bib DIY station and of course food catered by Hill Country BBQ. I of course was hands-on with putting together the dessert table (my fave! ), I’m particularly lovin’ the donut tower with the mini bunting baby banner! I had to hand make that banner, luckily it wasn’t too hard and it came out pretty cute right? The “baby info” and “fuzz the cat” cupcakes were housed in the carousel cupcake holder and ferris wheel cupcake holder, I love those things! Hope baby mama, Miss Info had a blast!